It’s time to pull out of storage all your outdoor furniture and get it ready the fresh days of spring and the long, lazy days of summer. Spend a little time on spring fix-ups and you’ll have less to do a few months from now when fall is turning back into winter and you’re getting ready to put it all back into storage once more. Taking the time to clean and repair outdoor tables, couches, chairs, and umbrellas means you’ll be able to extend the life of your investment—sometimes for years. Give wood, metal, wicker, or rattan frames a wash with cold water and a mild soap to remove dust and dirt. Any cushions should be washed according to the manufacturer’s instructions to keep fabric colors bright and cushion fillings full and plump. Be sure no soap remains. Dry thoroughly to prevent rusting or warping. Metal frames and parts can rust over the winter months. Use sandpaper to rub away rust and then apply a clear wax or rust-inhibiting primer and paint to prevent the problem from happening again. While a little rust can add a nice patina to your patio furniture, lots of untreated rust will eventually eat away the metal structure and make your furniture unstable. Any cracks in wooden furniture can be filled with epoxy or wood filler. Choose a product that closely matches the color of the wood and then sand and paint or stain the filled-in gap. If the weave on your rattan or wicker furniture has become damaged, this is the time to take care of it. You can purchase rattan reeds or wicker straws from websites on the Internet if you want to do the repairs yourself. Otherwise, bring the furniture to someone skilled in doing such repairs. Paint the repaired areas to match the untouched areas or use the paint job as an excuse to completely change up the look and color of your patio furniture. Use a can of WD-40 or other household oil or grease to loosen up hinges and coat moving metal parts. 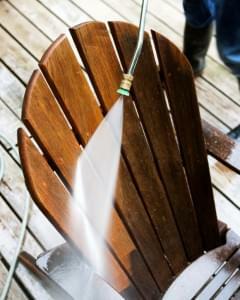 If your patio chairs spin or rotate, dab a little oil into the works to keep things quiet and smooth. Once you have your patio all set for BBQs, dinner parties, or long evenings laughing of and talking with friends and family, it will feel as if summer has finally arrived. Use self-storage units to safely store your seasonal furniture or tools when they aren’t needed. Value Store It offers self-storage units in a range of sizes. Visit our Home page to find the unit that’s right for your storage needs.